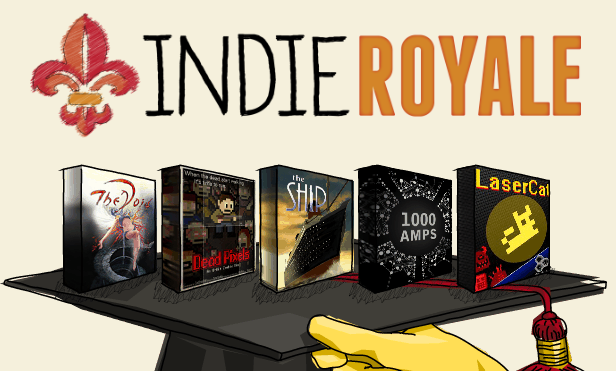 Welcome back to another round of the Indie Royale, this time in celebration of that wonderful time of the year when the whole summer is ahead of you. In this bundle, there's plenty of slightly obscure or unknown games to check out, so you might find a few new games you never even realized you wanted. Bizarre first person adventure? B-movie beat-em-up? 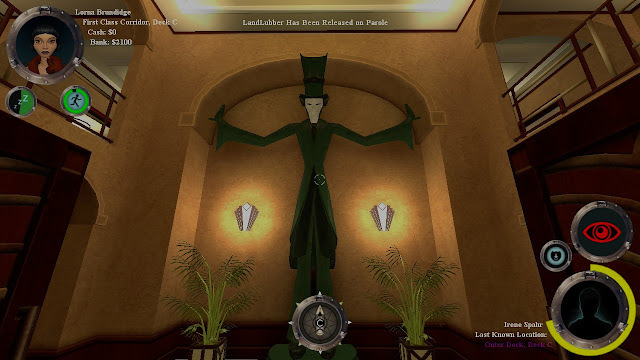 Murder simulator? Electrical engineering? Kitty? It's all here and more. But you'll never find out if I just keep talking, so let's get right to the games! Skip past the break and we'll chat about the seven titles included. But what exactly is The Void? Well, the Indie Royale page calls it an action adventure. I'm going to go in a slightly different direction and call it an avant-garde Harvest Moon. You see, colour is the most important thing in the Void. It's your health, your stat boosts, your attack method, your puzzle solving tools and your seeds. There's never enough of it, so you need to explore little tiny pocket dimensions known as chambers to get more, and also visit gardens and infuse colour into trees to grow more for later. 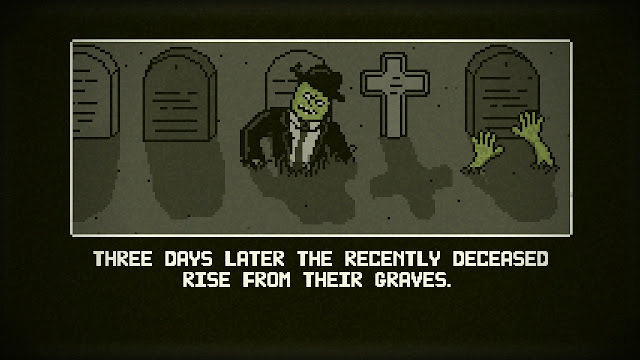 Dead Pixels is neat little game where the wit extends far beyond the very clever name. 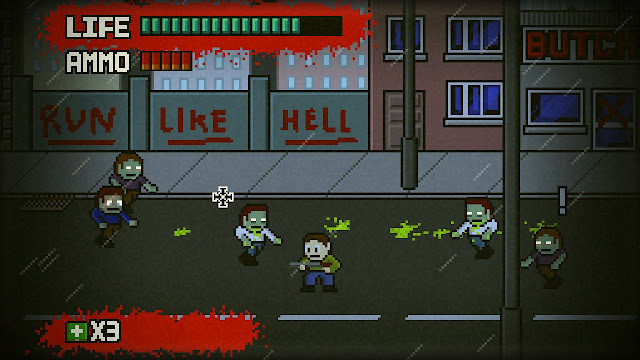 The game itself claims to be "an 8-bit zombie sim", but in reality it's far closer to a mash-up of Left 4 Dead and River City Ransom. So while zombies aren't exactly fresh gaming fodder these days, it's been a while since a beat-em-up with the depth of River City Ransom came along. I barely even need to talk about the story here, since it's pretty much just getting to the chopper like most zombie games. However, it's important that the presentation gets everything right. Everything from the intro cutscene onwards is perfectly built with all the NES game tropes: you've got your Mega Man influenced character designs, your River City Ransom upgrade shops and your overwrought Ninja Gaiden cutscenes too. If you're a NES fan, Dead Pixels works simply because it's brimming with nostalgia. But on a higher level than the NES authenticity, you have the game's B-movie roots. 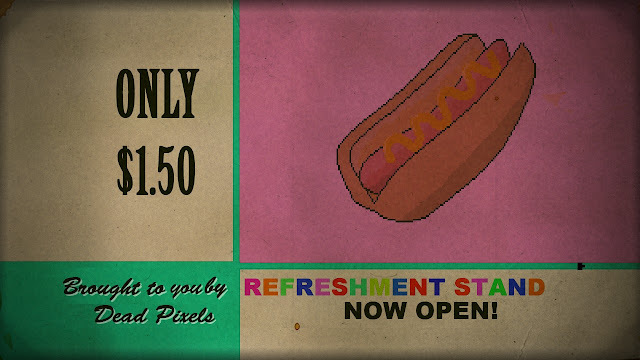 The whole thing has a pixel based film grain filter, a mid-game intermission for a hot dog and even the Feature Presentation bit from Kill Bill, albeit with a retro twist. So clearly, I have to grant top marks for presentation. In terms of gameplay, things can be a little bit hit and miss. The game is at heart a beat-em-up, with a campaign divided into a set number of streets full of houses to loot and zombies to kill. You can either shoot or melee your opponents to death, or use a couple of circumstantial special items to get out of a tough spot. One mixed feature is the game's relative lack of ammo. On one hand, it's a neat way of incorporating survival horror elements. On the other, it forces you to rely on your melee far too much, which isn't very cool looking and kind of overpowered against everything but a massive horde of brain eaters. Melee is also slow, so most of my gameplay strategy was to just run from trader to trader and ignore the vast majority of the enemies. Effective? Sure. Fun? Sort of. Looting never really loses its charm, and the upgrades and new weapons to buy are great. It's just the running that got to me. In fairness, hoarding ammo and running is exactly what you should do in a zombie apocalypse, but it doesn't always make for compelling gameplay. On the flip side, the gun play is a ton of fun, but is limited by the low ammo resources. But aside from the minor melee nitpick, Dead Pixels managed to be a pretty impressive experience. The atmosphere is great, and the eye for detail gives the game even more charm. It's also got a full local co-op mode, and an additional campaign and survival mode to mess around in. If NES nostalgia is your thing, Dead Pixels does a fantastic job of bringing the B-movie influence to 1980s gaming. The Ship is a Source mod turned full fledged release. However, unlike most Source based games, The Ship hardly revolves around shooting, or twitchy reflexes, or dinosaurs. That's not to say there won't be plenty of murder, because pwning noobs is definitely still on the table. It's just combat in a totally different way. You see, The Ship is a stealthy cat and mouse murder spree set on a cruise ship with all the usual amenities. The official story behind the game is that your ship has been co-opted by Mr. X, a madman who plots a most dangerous game for his guests. Passengers are given the name and general location of one of their fellows, and are told they need to bump off the individual while avoiding whomever is supposed to do the same to them. So you and 15 other guests or so need to stalk around the ship, raiding cabinets and boxes for knives, swords, blunt objects, disguises and the occasional blunderbuss. Particular weapons are given a higher bounty when used to axe your suspect, but if there are too many witnesses or if it's caught on camera, you're sent off to the brig for a fine and a jail sentence. 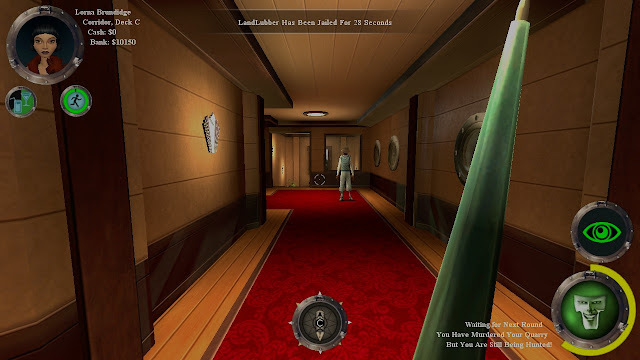 While the concept of a mass stealth game was pretty new when The Ship originally came out in 2006, it has since become a bit more common with big budget versions like the Assassin's Creed multiplayer, and smaller indie titles like Spy Party. But The Ship distinguishes itself with a neat and slightly bizarre needs system. Murder works up an appetite, so your individual character has a slate of needs ripped right from The Sims. If you run too much, you'll need to find a coffee to re-energize. But coffee makes you pee, so go find a bathroom. But now you're all dirty, so you need to wash your hands. It's a delicate act to keep yourself healthy while still finding time for murdering your pals, but it's a great way to discourage camping and to force players to drop their guard. It's not all roses though. The Source engine helps to give the game a great, stylized look very much in the TF2 vein. 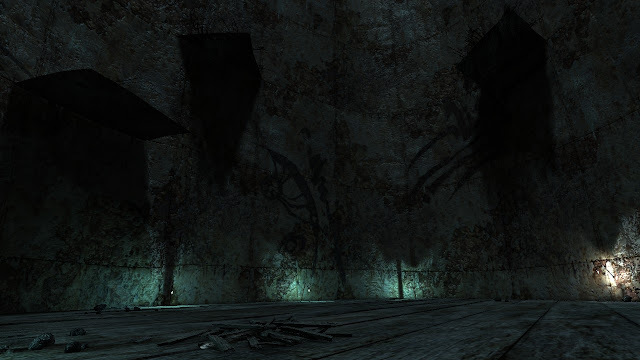 But it does present some awkward clunkiness in the combat and the network infrastructure. Setting up a multiplayer match proved impossible for me due to glitch after glitch, but there's a small dedicated server community to dive into that's not too racist or awful. Combat itself is a bit awkward for anything more than a couple of sharp whacks across the noggin, due to the glacial walking pace of the characters and the off collision detection. Lastly, the singleplayer is very short and little more than an intro to the mechanics but it's clear that the meat of the game is multiplayer, although arcade mode with bots is pretty fun as well. But those are nitpicks that don't really impact the base idea of the game. 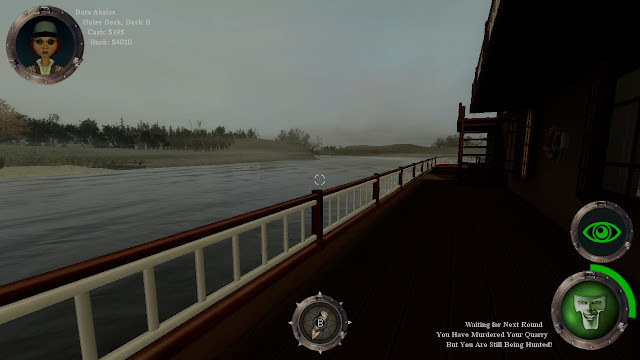 With a few friends over a LAN network or Hamachi connection, The Ship is a great diversion from the usual fare of FPS games. It's got an innovate hook and great built in systems to encourage the murder and mayhem. Altogether it's just something that's completely different from anything else out there, which alone makes it worth trying. Come for the innovation, stay for the cash bonuses and axe-murdering. Side note: buying The Ship from the Indie Royale nets you two full versions of the game to pass out to friends. Each of those copies includes one other full gift version for said friends to pass along as well. It's a ridiculously generous offer, and a great way to convince your friends to join in. Between 1000 Amps and LaserCat, it looks like this iteration of the Indie Royale is certainly a good pick for platformers. 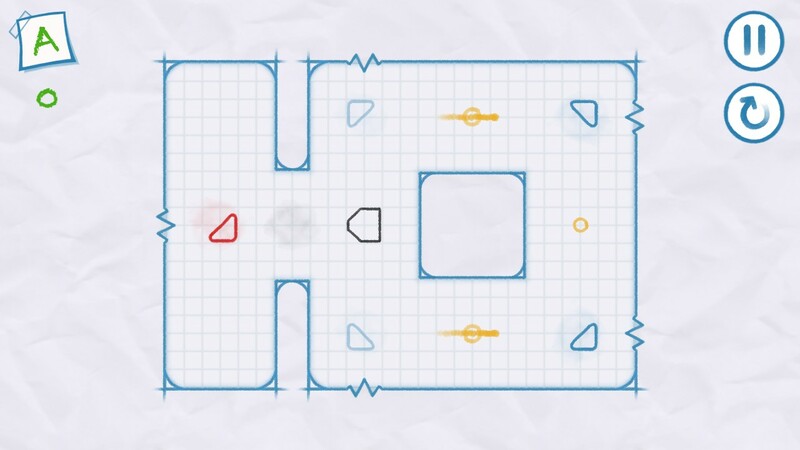 And while LaserCat takes a more traditional approach to the genre, 1000 Amps fills its gameplay with minimalist design and an interesting puzzle approach that requires plenty of fumbling around in the dark. In 1000 Amps, you are a small little light sprite thing, travelling through a very extensive open world dungeon of sorts, except it's hard to tell at first because there is literally nothing to light up the layout. 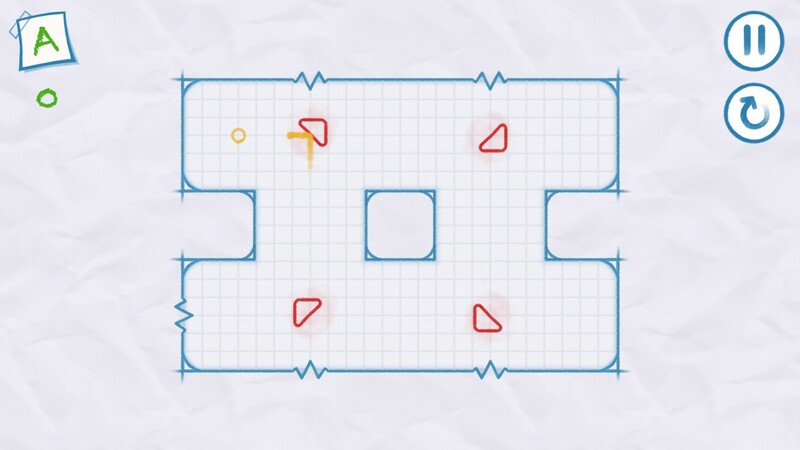 Touching any block will reveal it, which means you need to sort of feel your way around each room to avoid surprises and figure out the blueprint. Each room also has a certain number of light blocks that need to be lit. Doing so will slowly power up your sprite, and finding every light without leaving the room reveals the entire room permanently. It's certainly a unique and lovely mechanic that gets used in many surprising and inventive ways. The room layouts are well designed, and often challenging and twitchy without becoming unfair. Plus, there's a whole lot of them. The world is indeed huge, with plenty of branching routes and secrets to find. Also mixing things up is the limitations of your character. 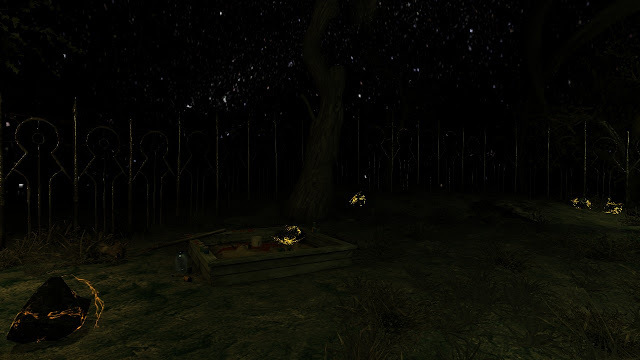 With zero lights lit, your little sprite is pretty listless and unable to jump much. With each new block, your dexterity increases until eventually you can take massive leaps everywhere. 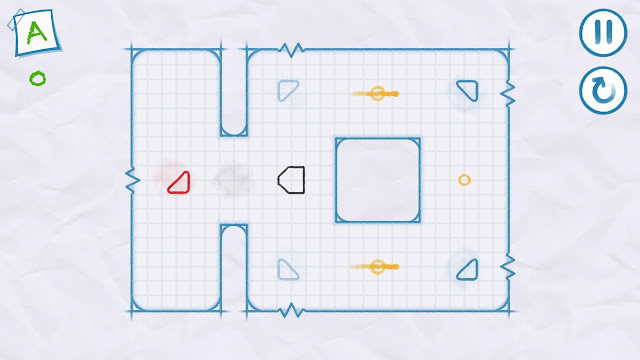 This contributes to the awesome level design by building a very tiny Metroidvania layout in every room, allowing the game to limit and gate your progress and throw in some neat mazes or puzzles to boot. You do get some extra mechanics thrown in, like the limited ability to teleport, but it simply gives the game more versatility and entertainment value for the puzzles. In the end, 1000 Amps has all the great hallmarks of a worthy indie platformer. It looks and sounds excellent, with great context sensitive sound design and simple but effective black and white graphics. The central mechanic is a unique idea, making the game more about caution and context than twitch action (though that still comes into play). It appears to be a relatively simple title, but the huge world and extensive room sequences prove that there's a lot more to this tiny platformer than you may realize. Ever wonder if Captain Viridian had a pet? If he did, it probably would be LaserCat. There's a lot of inspiration from seminal indie classic VVVVVV, mostly due to the shared influence of the many early, unusual and often nonsensical platformers for the ZX Spectrum. 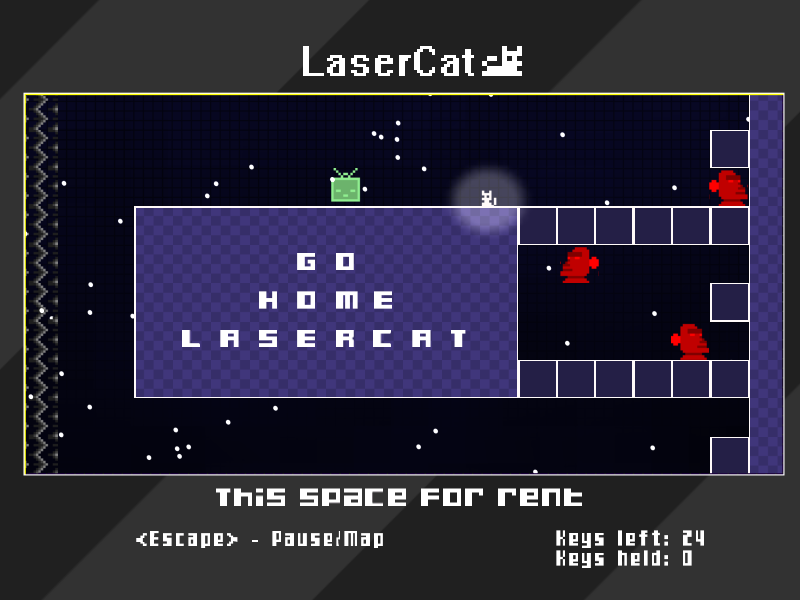 Like its predecessor, LaserCat is a relatively open world platformer based on quick reactions and plenty of checkpoints. However, it offers a relatively more traditional experience while also concentrating on exploration over raw difficulty. LaserCat tells the adorable story of LaserCat, whose equally adorable business partner Owlfriend has been kidnapped by the awful Wizzord. To get him back, you're going to need to collect all thirty keys hidden around the expansive world. It's no easy feat, as you have nothing but a jump button and a series of warping checkpoints to do so. Due to the high number of keys, traps and one-way paths, the majority of the game is poking around and hoping to stumble into a new area, and then snatching up any keys and banking them at the closest checkpoint. There's a map, but it doesn't help a lot with finding unexplored zones. Still, it's relatively free-form and easy to get around to the big areas. Easily my favourite part of the game is style. While it shares the same ZX inspiration as VVVVVV does, LaserCat uses all sorts of cheatsy improvements to the graphics to create awesome graphical effects like rain and such. Instead of looking like a straight ZX homage, it appears more like a modern graphical interpretation. The soundtrack is pretty fantastic as well, offering up great digitally influenced electronica that was actually quite catchy. My favourite bit is the question bonus round, which is a screen that appears after you grab each key and questions your general trivia knowledge. Don't know when the Battle of Hastings was? Looks like you're not getting a key this time. The questions also allow the clever writing to shine through, with plenty of nifty pop culture references and decent jokes in the questions and level titles. I don't want to oversell the VVVVVV comparison because they're clearly both very different games that only share the open world concept and general graphical influence. However, if you were a fan of that game, chances are you'll be a fan of this, even without any offbeat mechanics. It's pure, basic, essentialist platforming that's both adorable and quite a bit of fun. It's certainly worth checking out even if you bought the bundle for one of the higher profile titles, because it's very amusing experience from start to end that's well worth the time. A free to play game in an indie bundle? That doesn't make a lick of sense; it's already free! Sure, you get access to the Steam beta as opposed to the standalone one, and you also get a free XP boosting item, but it still seems a little funny at first. However, I'm one hundred percent behind turning this into a trend if it introduces me to more high quality free to plays like AirMech. Before reviewing a free-to-play MOBA game, I should probably tell you exactly how much I avoid the genre. Aside from the odd game of League of Legends to appease some friends, I avoid MOBAs like a plague. It's a combination of slow reflexes, a general fuzzy confusion about RTS titles and a dislike of "competitive" multiplayer that keeps me from getting into any MOBAs in a big way. 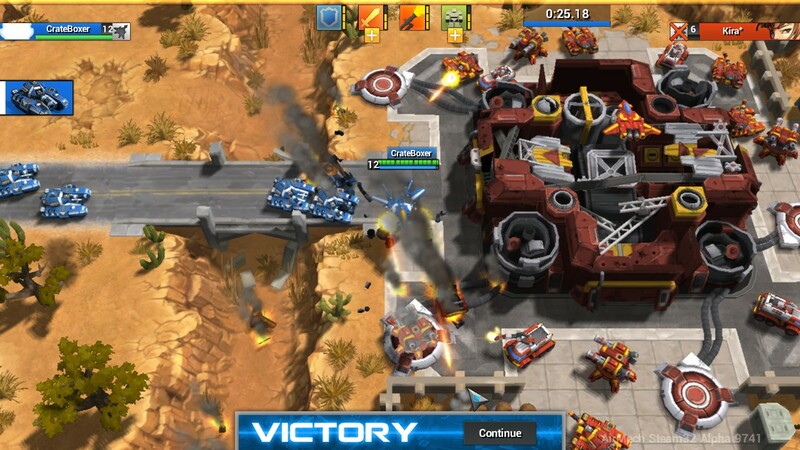 With that being said, AirMech is perhaps the first MOBA game I've decided to stick with regularly. I can't overstate just how praiseworthy that is. In AirMech, you control a machinegun toting robot that, surprise surprise, can hop into the air and transform into an airplane. With reckless disobedience of TSA guidelines, you use your robo-avatar to direct an army of units and destroy the other team's base. Like most MOBAs, creeps will spawn every few seconds to advance on the enemy. However, you can also build bigger and better units using the currency you pick up from kills, and have them delivered to any captured factory. This builds a neat mixture of the slow attrition wars of MOBA games with the tactical rock paper scissors arms race of Advance Wars. Instead of being entirely expendable fodder, infantry are valuable resources required to capture territory and advance your production capabilities. The best part is that battles can be as hands on as you want. 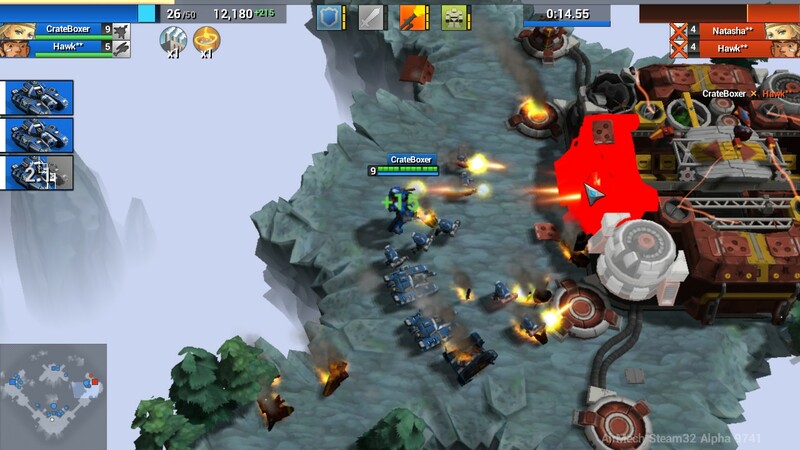 In plane mode, you can drag and drop units anywhere on the field, provided the AA missiles don't forcibly ground you. In robot form, you can take down other robots and units that your own regiment might have trouble with. You can zip around anywhere on the map in a matter of seconds, so every moment is fast paced, exciting and dynamic. It really prevents the usual stagnation in most MOBAs by giving you a ton of tactical options. Stuck in a stalemate? Airlift three tanks just north of their base. That'll cause a ruckus. There's plenty of smaller things to love about AirMech too. It's a very lightweight download clocking in at just over 70 megabytes, a far cry from the massive size of many free to play MMOs. It mostly uses the League of Legends payment model, so everything game balancing is unlockable with currency earned for battles and the only items that require you to grab your wallet are cosmetic. Also borrowing from League of Legends is the trial system, which unlocks certain units, pilots and mechs to test drive on a rotation. It's also got a pretty great selection of maps and options, including 1v1 duels and plenty of bot support for when friends aren't online and random team-mates are just not working out. As someone who avoids the entire genre as a general rule, I was thoroughly impressed by the quality and polish of AirMech, even in its alpha stage. I certainly plan to make good use of that 5% XP bonus offered by Indie Royale, and I heartily recommend checking the game out. Hot on the heels of the bundle release, Ichi was revealed as the Indie Royale bonus game. 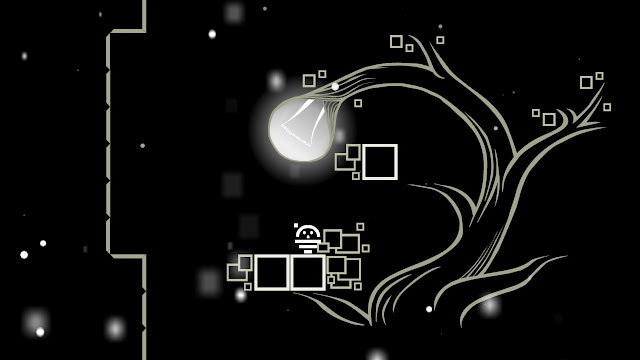 Ported from a popular iOS app, Ichi is a particularly clever puzzle game that entirely relies on one button. The impressive part is just how many mechanics get thrown into the dozens of levels while keeping the limited control scheme in place. Add good art, fine sound design and a ton of user created levels on top of that, and you have quite a meaty casual puzzle game. At first, Ichi revolves around rotating a series of marked triangles to reflect a ball ninety degrees and collect a series of coins. Thanks to the hand-drawn graphics and grid paper layout, the game looks and feels very basic at first. I mean, how many puzzles can you have that are just spins on a rotating angle gimmick? But then, the game will start to throw slight curves into things, like the ability to draw a temporary barrier or newfangled disappearing triangles. Pretty soon you're juggling multiple balls through huge, dangerous playing fields with no idea how these crazy mechanics snuck up on you. The best casual games stealthily overcomplicate the game without the player noticing or becoming frustrated, and it's a feat that Ichi accomplishes handily. It's clearly a very simple to understand game, and it does feel far more appropriate on a phone than on a desktop. 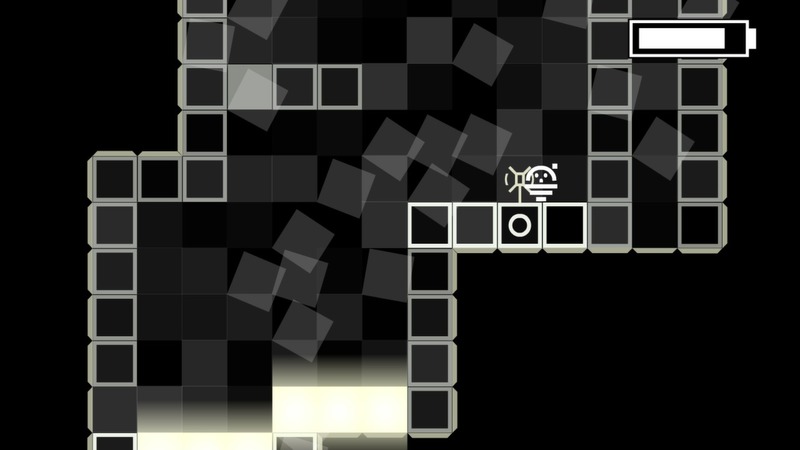 But Ichi is a solidly designed puzzle game that begins with new and interesting mechanics, and then simply builds on those mechanics until you can hardly believe just how complex the puzzles have become. In other words, it's the perfect bonus compliment to an already excellent bundle line-up. There's not a lot of instant name recognition with this Indie Royale, but that didn't stop me from really enjoying each of the titles offered. If you're on the hunt for something new to try, this is a pretty great collection of offbeat titles I never would have otherwise found out about. If your interest is piqued, pick one up below. Also, keep up with The Backlog Journey on Twitter, Facebook and Google Plus, and be sure to spread the word around. Word of mouth is where 90% of the traffic comes from, so every bit helps. Plus, check out the Steam group and we'll play AirMech and more some time.